Thank you to everyone who tackled my difficult task of matching each of Henry VIII’s wives with their personal mottos. I think what inspired me to pose this question was reading about Anne Boleyn’s motto, “The most happy”. In view of her tragic end, and her own personal story which involved a forbidden romance with Henry Percy, son of the Duke of Northumberland, I thought this was so ironic and touching. It makes a fresh contrast with all the others, which reflect a strong sense of duty, piety and humility. 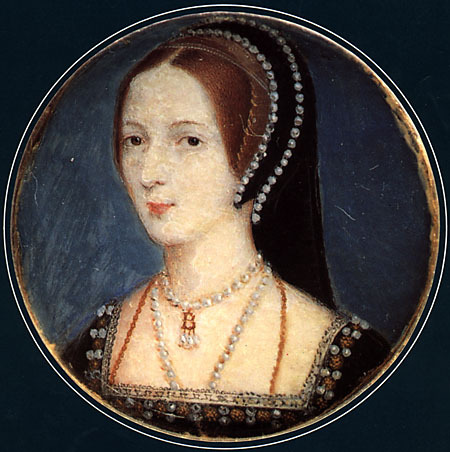 Most people knew Anne Boleyn’s and Jane Seymour’s mottos (65% got these right), while 55% correctly picked Anne of Cleves’ motto, 53% knew Catherine Parr’s, 45% knew Catherine Howard’s, and only 37% knew Catherine of Aragon’s. I think I would have been hard pushed to get them all right – Catherine Howard’s and Jane Seymour’s in particular are quite similar. Thank you for sharing your thoughts about what you would choose for your personal coats of arms and accompanying mottos. For my own, I think I would have a skylark singing above a field of buttercups, with the motto “Love over gold”. I admit that I borrowed this title from Dire Straits, but I do identify with the lyrics as well! So what have I got lined up for you next? In celebration of the Diamond Jubilee, I thought I would give you a monarchy-themed question this week. Let’s go back in history, and take a look at the very first kings to sit on the throne of England. In the tenth and eleventh centuries, the kings of Mercia were rising to power in the regions that would become known collectively as England. The term ‘England’ was still a new concept – instead, these early rulers would have thought of themselves as Kings of the Anglo-Saxons. They had to fight to keep the crown: they were constantly threatened by the Danes, who had made a nuisance of themselves by invading and settling in the east, and then demanding payment for it. Just glancing through a list of monarchs in the Middle Ages seems to conjure up the colour, the richness and the earthy kind of Englishness of that period. Wouldn’t you just love to find out that one of them was your ancestor? “Oh, by the way, Edward the Confessor was my great great uncle.” I would be boasting about it all the time. Here is a list of English and Scandinavian leaders whose names I find particularly evocative. I haven’t made any of them up! What I would like you to do is decide which ones ruled over England, for however brief a time. There are nine to choose from: six of them sat on the English throne. I’ll reveal the answers on Tuesday 13th June, and set a new challenge! I just picked my six favourites – great names! Edgar the Peaceful sounds okay but I’m not sure about the others. Love your blog! Can’t wait to find out how many of the medieval kings I picked correctly. Thank you, Susan, and thanks for following! Fingers crossed! I will take a look at your own blog – sounds very interesting.